And I think I speak for all of us, when I say: RULERS! ;o) Thank you! Now only an Info-HUD and layer-folders and I can shed myself of PS! Looking forward to it. PM hasn’t quite ousted the other art packages from my machines just yet but tbh I look forward to the day that it does. Nice one on the rulers, yep they’ve been one of my big wants when using it, curves’ll be useful too (although I don’t tend to use them that much). Next on my wishlist would be CMYK and gamut check. As ever like to catch up on the new stuff though so keep up the good stuff. You shure know how to tease. I´m really looking forward to the next release. Rules, grid and guides are a very welcome addition. Now, if you could give the “Transform” command a keyboard shortcut, I’d be in heaven. Resizing/rotating are two things I (and I suspect others) do most of the time, and moving the mouse back to the menu bar and through the Edit > Transform > … menus gets tedious. Keep up the great work! Iterate, iterate, iterate! This update looks so good!! Thank you for your good work, I can’t wait to play with it! I’ll be honest, guides was pretty much the only reason that I wasn’t switching. Well, guides and an info HUD window. Will there be an info HUD window in this release? And it keeps on getting better and better! You do an Xcellent job guys ! Let’s keep on this way. 6 People now? That’s great news for the development, and great news that it shows Pixelmator is doing well! Always looking forward to the next release of Pixelmator. Keep up the fantastic work as ever, guys. Even though Pixelmator doesn’t yet have every single feature I’d like, it’s comforting to see continuous improvements to the program. I’m very happy with Pixelmator. Happy to contribute those guys to build a great piece of software. Thanks again from Italy. Have a nice day. I’m still waiting on CMYK. Registered Pixelmator user, and using it for some web stuff, but I’ll never leave Photoshop until CMYK support is in there. What I really hope is coming is a shapes tool and layer folders. Thats all I ask for. Oh that and the ability to double click a text field to edit it! I would also love to see CMYK in pixelmator, without it i can´t use it, since i do a lot of print graphiks. YEAH! AT LAST ! And now, make it work better with very large files, and add a path tool, and CMYK and it would be excellent! No need for Bloatoshop anymore! One more vote for CMYK. Can’t throw Photoshop until Pixelmator supports that. Your palettes are animated? How can I get me some flying Pixelmator palettes? Wait… you use Ps for web work??? There’s your problem. Fw is the best web design app in existence. Its export to web support is highly optimized for the best quality and smallest file size possible. Ps is a joke when it comes to web design. For those who don’t know what the heck Fw is. It stands for Adobe Fireworks. I do not know why they would not eventually work on CYMK support. I could see this in 4-5 years with good development and focused work that it could become a photoshop killer. Good good good… Any new localization in that version? Let’s say… French? where we can get this cool wallpaper? 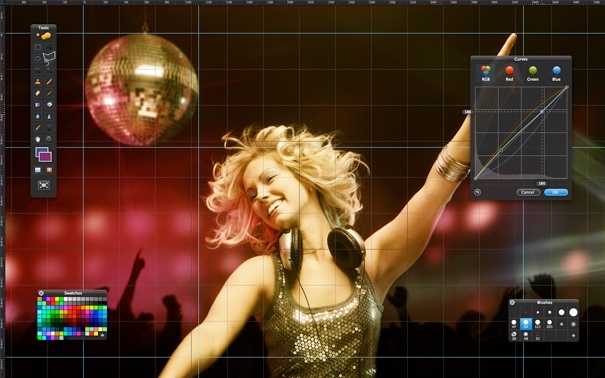 Can you imagine having Pixelmator 1.2 Draftsman wallpaper, while using Pixelmator? That would be CRAZY! So, what does “soon” mean to you, Pixelamtor Team? Before stepping to CMYK world, it would be super duper fantastic if you guys implement Save As for Web with the ability to optimize PNG, GIF and JPEG files for web. I have pixelmator license and want to use it for my blogging needs, and this feature is all i ask. I don’t really care for CMYK, i have photoshop to do that, i just want to do little amazing stuff for my little work. Good heaven, we have a ruler in not so future and also a pretty grid. Keep up the good work guys. I second ncus comments. I also have a license of Pixelmator — to be honest, two licenses, one of which came with MacHeist — and unfortunately I still don’t use it, because of the Save For Web feature. I found myself using ImageWell a lot, although it’s now a paid app, and I’m really trying not to license it. Other than that, awesome update, very nice features which will help to spread the word about Pixelmator. I’m updating it right now. Here here! Just add an information hud so I can see what pixels I’m selecting, and it’s bye-bye photoshop for me! Good job on Pixelmator guys! Bought Pixelmator as an alternative to Paintshop pro as I moved from PC to MAC and didnt want to go down the route of Photoshop. Only after buying it and using it for a day or two did I realise that it cant do even the most basic maniplulation of fonts. No Bold, or Italics and i wont even mention antialiasing! very disappointing. Of course I have no idea is Pexelmator’s code would be suited to this kind of thing but it’s pretty well done so far so I’m a hoping…. and I’d pay at least $150 (happily) for a faster full featured image editor. Pixelmator is a breath of fresh air. Having used PS for over a decade, I needed something simple for beginners to help them to make their own websites. Pixelmator does the job without going over the top.